Transport control expander unit for use with Eclipse SX Midnight. Provides hardware control of transport and locator functions in Final Cut Pro, IFX Piranha Cinema and IRIDAS Speedgrade. 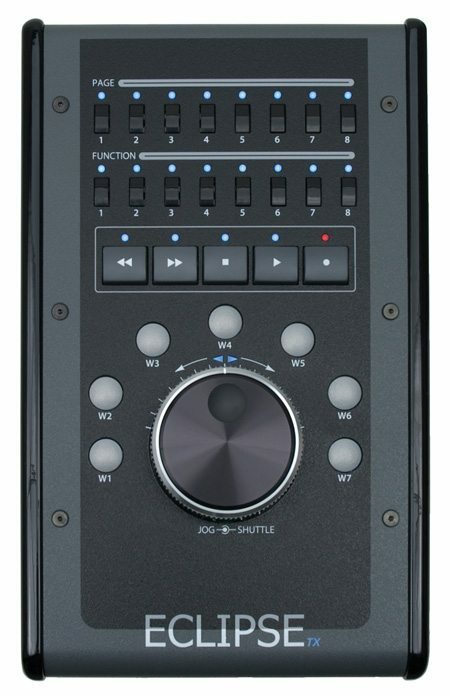 The Eclipse TX Midnight is a compact desktop transport control surface which provides hardware control of the transport and locator functions within Final Cut Studio and other editing applications. It is equipped with JL Cooper’s classic weighted dual-concentric jog/shuttle wheel which gives the operator rapid, simple one-handed control of an edit application’s timeline. The Eclipse TX Midnight is intended as an add-on extender for the Eclipse SX colour grading controllers, and has the same clean and elegant styling. 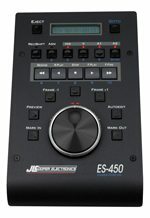 A stand-alone transport controller is often required for many other video and audio applications; the Eclipse TX Midnight SA variant is available for these, and may be ordered with an interface card to suit the software/hardware combination being controlled.